Air Fire Water Earth are four elements that compose all things – states the ancient Greek philosophy… By noticing the balance of the four classical elements we discover the realm of human life… While the fire element stands for the sun and all electric fields around us, Water is the magnet that attracts and receives all energies. Take a wooden match, light it and watch: the wood will transform into charcoal and as the flame goes down, underneath you’ll perceive a little bit of water, which will evaporate and transform into hydrogen and oxygen. You have just demonstrated what people from ancient cultures discovered, that the main elements of life as we know it are: Earth (the wood), Fire, Water, and Air. – and actually – Energy / Consciousness – In this case it was your willingness to do the experiment. This is how, simplistically speaking, thousands of years ago, by reverse reaction, fire energy (sun and electricity) put carbon (C) and water (H2 + O2) together to give birth to organic (living) matter. 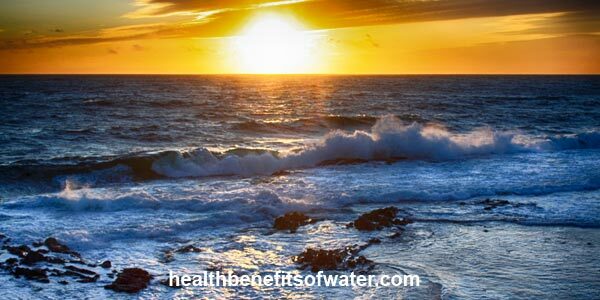 The health benefit of water is strongly related to the whole – air fire water earth – system. Do you see any similarity between the water crystal and this image? Actually this graphical image is a very familiar one: you can find it often in folk art around the world and it’s called “The Flower of Life“. Its symbol is considered to be sacred among many cultures, both ancient and modern..
– The hexagon is associated with many forms in nature, such as crystals, snowflakes, the cells of a honeycomb or the disposition of the elements in the organic matter, even DNA…. The hexagon can be found in all the building blocks of the universe that we call the Platonic Solids. It can be used as a metaphor to illustrate the connectivity of all life (air fire water earth), and spirit within the universe. Implicit within the hexagon is the six pointed star or hexagram, seen as two equal and opposite equilateral triangles overlapping. – Three is said to be the trinity of creative power, and six the number by which the universe is made… “The Ancient Secret of the Flower of Life”- by Drunvalo Melchizedek is a book the explores the deep connection between the main elements of nature: air fire water earth and spirit. The water molecule has a tetrahedral shape. The 5 elements Air Fire Water Earth and Spirit constitute the creation of the material life and are acting together to maintain it, only if the very precise balance between them is respected. Leonard Orr (the author of Breaking the Death Habit : The Science of Everlasting Life) explains the technique and philosophy of how to transform body, mind and spirit by meditating on the elements of air fire water earth. He’s emphasizing the benefits of bathing for meditation relaxation. I thoroughly believe in this, because as shown in the message from water page: stress, anger and depression are the foundation of all diseases. The 5 elements Air Fire Water Earth are present in many cultures of the world and one of the most popular is the Chinese Feng Shui theory. This philosophy makes us understand how every element in nature interacts with the others, acting as a whole to create and maintain life.